American. Composer, songleader, cantorial soloist, choir director and music educator. Born and grew up in Baldwin, NY, graduated from Brown University, and has resided in Northern Virgiinia since 1977. Her music is “characterized by its lovely and singable melodies; her focus is on creating music for congregational and school use.” Ms. Leon is the current and founding director of several Jewish youth and adult choirs in the Washington, D.C. metropolitan area, coordinates Northern Virginia’s annual Jewish choral festival called “NoVaShir,” and teaches and leads Jewish music at several area schools and synagogues. 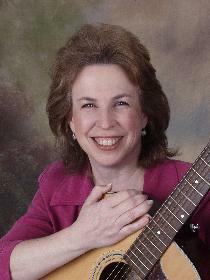 Her works include “Family Shabbat” (with CD, 2000), “Jewish Life Cycle” (2002), “Gan Shirim: 70 New Jewish Songs for Children” (with double-CD, published by KTAV Publshing House in 2004), and “A Healing Service In Song” (DVD, 2005). Her “Shalom Aleichem” and “Nakum Uvaninu” were selected for the International Festival of New Jewish Liturgical Music held in 2004. Several of her songs have been arranged for volunteer choir. Her “Patriots’ Dreams” was selected in 2002 as the George Mason University alma mater.